As a ceramic artist, I choose to create functional tableware inspired by nature and landscape. I see making functional ceramics as a way of life and use nature as an inspiration for form and surface. The exhibition, Celastraceae, is a display of my most recent work inspired by my adventures, travels and lifestyle. Celastraceae is the latin word for a flowering plant family the includes woody vines, shrubs and trees found in the northern hemisphere, as well as a subfamilies of small green flowers, also known as the “Bittersweet” family. This past year, I have travelled to various countries and regions with my family - to hike and enjoy the simplicity of nature. These experiences have become inspiration for my color and surface of my most recent body of work. I enjoy hiking in the woods, exploring the foliage and the views along the way, whether that be seeking adventures on the top of ancient mountain ranges of the Isle of Skye in Scotland or walking on the Cliff of Culter Coast in Maine. All the wildflowers, tall grass, small green leaves and shrubs found in these places, have become an influence in my ceramic making process. My lifestyle choices influence my decisions of making functional ceramics. 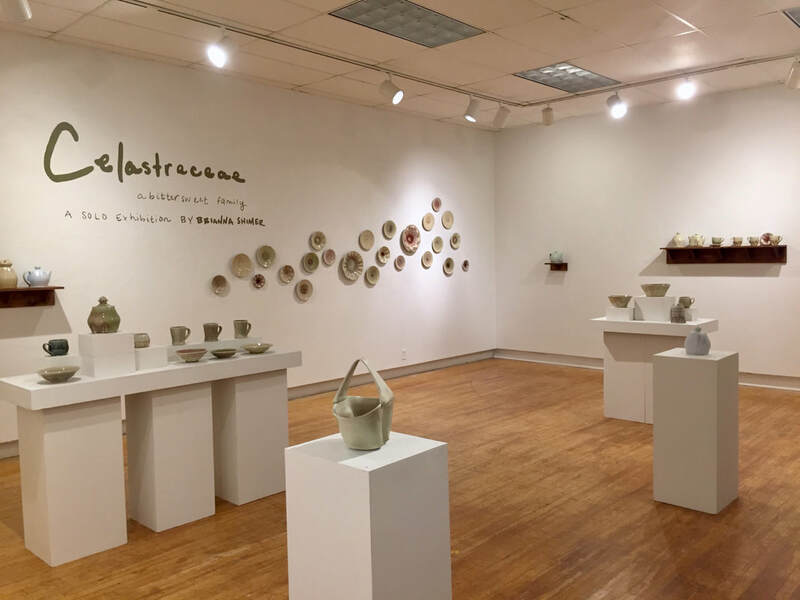 It is important to spend time on every aspect on making - throwing forms on the wheel, applying surfaces, investing in glaze research and controlling the kiln environment in which everything is fired in. The work I made is intended for daily life, that is stable and can withhold being passed through many hands. As a maker, I am constantly working on making new objects. The pieces in the exhibition pertain mainly to function of eating or serving food; concepts that relate back to my lifestyle and family.